This is a reprint of a previous post, circa "Dances with Leaves". Of all the gin joints in the universe, of all the balls of dirt and water and life run amuck, I had to end up on you. It's not like I called up my celestrial travel agent and made reservations for the next horrific birth in Biloxi. I would have sat around for eons on standby if I'd known what I was getting into. Well, I'm here, the next plane out isn't due for awhile yet, save some stupid accident or organ failure. so I have to make the best of it, which so far hasn't been according to plan, if I'd bothered to make one. You happen to occupy that sweet spot that so many of your breathren lust after, that narrow band of orbit from a nicely aged star with plenty of fuel to burn. You have a nice tilt to your axis which insures your top and bottom portions get equally browned, and equally iced. And up until now, you were the perfect host to a veritable riot of living diversity, give or take a few hiccups in time when an occasional meteor strike put a damper on things. And all along, you defied the odds, dodging pulsar beams, supernovas, and other sundry galactic train wrecks that makes the universe such a wild and crazy place. Then you screwed the pooch. You sat there spinning, nurturing an ever evolving mix of plants and animals, all living in a carefully crafted synchronicity, a dotting mother nursing her brood, perhaps until such time that she could spread her seeds into the cold, inhospitable vacuum of space, just to spread the love. Towards this end, it all came together, this thing called evolution, natural selection, survival of the fittest, and one day........WAHLAH! An ape had an idea. Oh, I imagine you must have been so proud as this one species of intelligent ape, with little going for it except for it's unique imagination, managed somehow to graduate from puny prey to horrific predator, all in a seemingly geologic blink of an eye. Creatures that used to strike fear into the hearts of all others fell before this new species, and with a few thousand years of learning and passing on that knowledge, rather than relying strictly on instinct, this nasty little creature spread all across your beautiful surface and began to alter it forever. This creature preferred the safe embrace of the cave, and if it couldn't find one handy, it simply built one from scratch. So there went the forests. An ever increasing number of these apes produced an ever increasing need for food, thus game animals, the big and slow first, then the fleeter of foot, began to decline. Hunting and gathering began to give way to the easier and more efficient crop and herd, and more land began to be altered to suit the needs of this one creature. If only these effects were the progeny of this new top predator, the rest of the biosphere might have accommodated the new reality. But no, these were not the only new rules being written for the new epoch. Throw in a newfound ability to harness aggression, a trait once needed by many species simply for survival and reproduction, and things really get interesting. Clans became tribes, tribes became villages, villages became towns, then cities, then nations, and it seemed each and every one of them had a bone to pick with every other one. Not content to make do with the resources available to them in their own locals, these bands of self-indulgent apes invented the art of TAKING what they needed, or simply wanted, from other bands of equally entitled apes who had problems with that idea. And thus WAR was thrown into an already screwed up mix of things that never should have happened. You despaired in thinking that given time, these willful new children of yours would mellow out, mature, come to realize their true potential and make you proud. Like most any parent, you want to deny that YOUR baby could be so dangerous. Now, much to late, your best and brightest have turned on you, despoiling you in every imaginable, and even unimaginable way they could think of. Your air, your water, your land is laden with poison, the very air you crafted to shield them from cosmic rays now stripped of much of it's critical ozone. The storms you created to help spread moisture and nudge the landscape are now killers, sucking on the heat building up in your oceans. The ice you coated your poles with is now melting, threatening whole ecosystems and the animals that have adapted to them over time, and threatening to steal more land from the continents and give it back to the sea. And fire, that element you unleashed to aid the forests and plains, now consumes them like some ravenous beast, All of this because of one damn smart monkey. 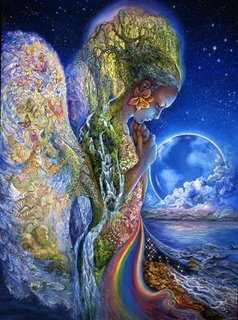 Mother Gaia, you brought forth my ancestors according to the laws of life, and here I am, in awe of you, not only of those nooks and crannies I explored of you on my own, but visited by means once considered magic, and you are so beautiful it makes me weep. I watch in horror as my brothers consume everything you offer, never giving anything back, and I am sickened by it all. So gather your strength, steel your resolve, marshall your forces and defend yourself. We are nothing but a virus, and you have all the cures at your gracious disposal. Hurricane, tornado, tsunami, draught, lighting, flood, earthquake, and famine, call forth your own horsemen, and call us to judgment. We have sinned against you, and deserve to reap what we have sown. No God in heaven holds us to account, not as we tread upon you, and no penitence in any afterlife will ever call us to justice. But before you do what you must, allow me one more sunset, one more autumn day as the leaves turn colors only you could paint. Allow me the gentle touch of one more gentle breeze, the smell of jasmine and honeysuckle, and the symphony of birds gathered in the trees. Allow me to thank you for my home upon your Earth, the water I drink from your rains, and the gardens you nurtured for me. I always loved you, and ask your forgiveness for taking all of your gifts for granted. I have never been worthy. Of all the gin joints in the universe, of all the balls of dirt and water and life run amuck, I had the honor to end up on you. This entry was posted on Thursday, January 31, 2008 at Thursday, January 31, 2008 . You can follow any responses to this entry through the comments feed .